The Cross House, upper stair landing, November 2015. There is a lot of information encoded in the above image. In the above terrifying image. To the RIGHT are plastic pinky tiles from a 1950 motel bathroom. The bathroom was created in what once a kitchen. The kitchen was created in what was originally thin air. 1894: The staircase stepped up from the grand entry to a landing, then stepped up to a second landing, then stepped up to a third and very long landing, and then stepped up to the second floor. There was a very expansive opening between the two floors. Quite dramatic. 1929: the expansive opening was reduced by half, and two kitchens created in the “new” space. The kitchens served two new “studio” apartments in former adjacent bedrooms. 1950: the Cross House was converted into a motel, the two kitchens were removed, and a motel room with adjacent bath were created in the same space. 2014: I removed the motel room and bath, and recreated the 1894 stair configuration with its expansive opening. This made me very happy. To the LEFT in the above image you see a vertical line, about 5-inches wide. That is where the 1929 wall had been built. 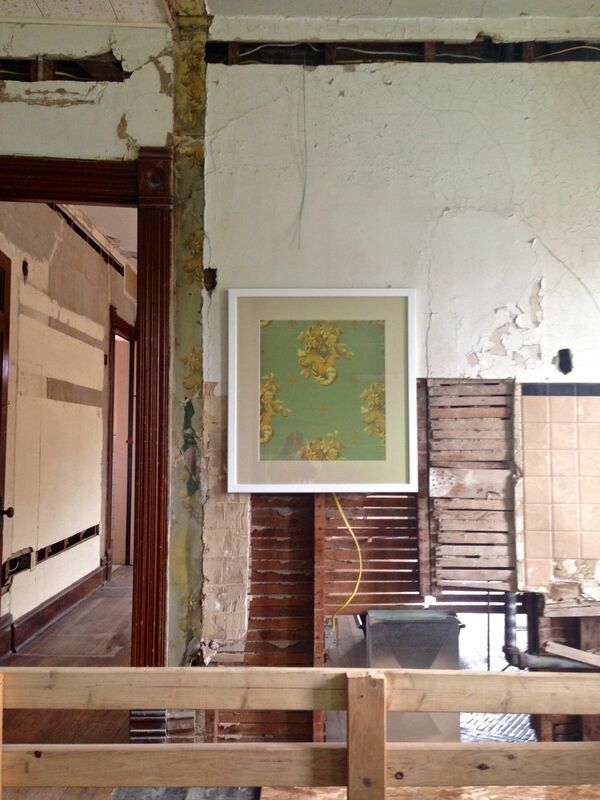 When the wall came down last year, layers of history were revealed: three different wallpapers. The most visible layer was the original 1894 paper. Wow. WOW! I did a post on discovery of this paper, who made it, and how it could be recreated. And I plan to recreate the paper (and frieze and ceiling paper) after I…win the lottery. In the meantime, I decided to have a fragment of the paper (which I managed to get my hands on) framed and hung next to the surviving paper. The original paper had a silvery background, not green like the framed sample. But the idea of the paper is now obvious. And this thrills me a tiny bit. BELOW the framed paper is a new AC duct, which will be hidden in the wall when all is done. NEXT to the duct is the 1929 (or maybe 1950) vent pipe for the now gone kitchens and bathroom. The pipe will go, too. I loath the idea of useless things hidden inside my walls, although I am carefully preserving the old gas lines which weave throughout the wall and floor cavities (the house had both electric and gas lighting originally). The DOOR FRAME is crooked. See it droop? That is because the wall you are looking at had nothing to support it under. It was always like this. This might have been OK had not the extra weight of the 1929 plaster wall, and kitchens and bathrooms, also not been loaded onto the floor — a floor with no support under. My solution will be to install a mighty beam under the wall, after slowly and laboriously jacking up the sagging wall. This solution will solve a 120-year-old issue. The 2x4s at the BOTTOM of the image are the temporary stair railing. Most of the 1894 railing is in place, but I have to recreate the lengths which were lost when the stair opening was shrunk in 1929. This material had actually been saved, but was largely lost in a fire in the house. Luckily the house survived. One Response to A Wall. Full of Information. I adore the layers of history and the narrative that this photo represents!! The wall, door frame, pink plastic tile, pipes and plumbing … it’s all part of the story.